This picture taken on May 28, 2014 shows Chinese farmer He Liangcai riding a motorized scooter suitcase that he invented on the street in Changsha, central China's Hunan province. Beijing: A man in China has built a battery-powered scooter with a suitcase which not only helps in the transportation of his belongings but also himself, a media report said Thursday. He Liangcai, a resident of Central China's Hunan province, demonstrated his invention at the Changsha train station, from where he rode to his home a few kilometres away, Global Times reported. The suitcase scooter weighs seven kgs and is capable of carrying two people. It can travel upto 20 km per hour for a distance of 50-60 km. It also comes equipped with GPS navigation and a burglar alarm. Since it is battery operated, it needs to be charged. 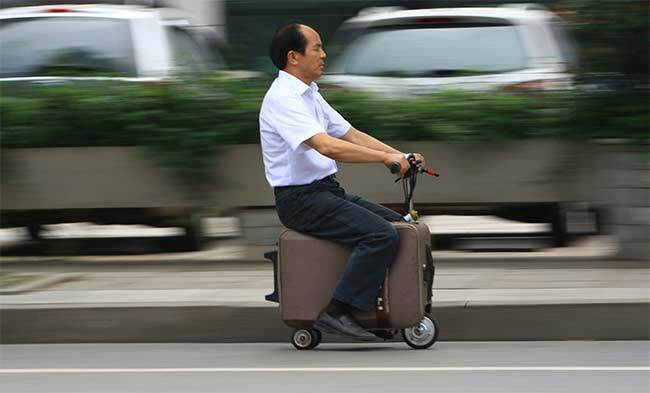 He, originally a farmer, said that it took him 10 years to invent the suitcase scooter. The vehicle is made from a stripped-down electric scooter which is embedded into a suitcase. The rider strides the rectangular luggage and grabs handlebars that control the throttle, breaks and lights. He is already a recognised inventor as he has won a prize at a US-based inventors awards ceremony in 1999 for the invention of an innovative car safety system. He said that he got the idea of the suitcase scooter when he forgot his luggage on his way to accept the award in the US.